A few days ago, the iPhone app 100 Cameras in 1 got an update with a great new feature: the ability to send photos to Instagram. As GigaOm’s Om Malik pointed out, this was the first outside app to gain such access. But that made it sound as if it was the first app to use a write version of Instagram’s API. But Instagram actually doesn’t have a write API yet (their API continues to be read-only). Instead, what they’re doing with 100 Cameras in 1 is much more simple and clever. And they’re now opening it up to everyone. This page (meant for developers) details the feature Instagram is calling “iPhone Hooks”. Essentially what these do is allow any other iPhone app (remember, Instagram is still iPhone-only) to interact with the Instagram app. 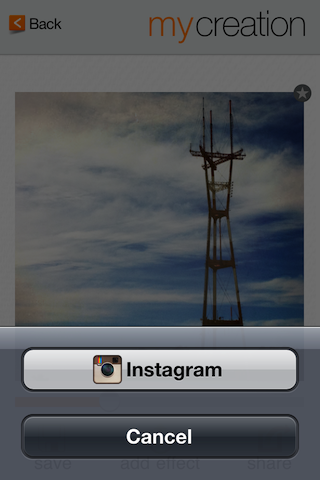 This can mean both opening the Instagram app to a certain photo, user, location, or tag. Or it can allow another app to open the app and load the Instagram camera immediately. Most importantly, it allows pictures taken with other apps to be seamlessly passed into the Instagram “sharing flow”. This means a photo can be passed into the app right to the filter screen within Instagram. Co-founder Kevin Systrom compares this functionality to the copy and paste functionality baked into iOS. But again, this is for images, not text. “We wanted to make it easier for other iPhone apps (and iPhone web-apps) to hook into Instagram to open a particular item or post a photo through our app,” co-founder Mike Krieger says. Yes, you read that correctly, this can work with web-based apps too. Currently, only 100 Cameras in 1 is using this functionality, but Instagram says they’re discussing implementation with other partners. And again, as of now, this is open to anyone to use. Hopefully we see popular camera apps like Camera+, Hipstmatic, and CameraBag start to offer this option. So what about a proper write API? Systrom notes that they could turn it on at anytime, but they’re hesitating right now as they don’t want Instagram feed overrun with low-quality images. Plus, Instagram is still interested in owning the posting flow. This work-around with a higher barrier to entry is a compromise, of sorts.